Sheila and I began our caravanning career more than 50 years ago, shortly after we were married in 1963. We were both teachers and to go with our brand new Sprite Musketeer, we splashed out on a 1964 Mk 1 Ford Cortina Estate. The prices of those two items seem ridiculously low at today’s values – the Ford Cortina cost £700 and the Musketeer £300 – but even so, we had to resort to hire purchase over two years to pay for them. Our first daughter was born the following year and right from the start we caravanned with her. On some Friday evenings, as soon as we were home from work, we quickly packed and set off for a weekend away. One of our favourite spots was at a farm site very close to Frensham Ponds in Surrey. No electricity of course; neither were there toilets and showers but at the equivalent of 12½p per night, it was fine. On other weekends we went to Kings Caravan Park at Pevensey Bay. That was an all “bells and whistles” site where we were charged a whacking £1 per night! By 1970 our ‘new’ Cortina had required extensive welding on the rear chassis members because they were rusting from the insides. I became so fearful of it’s weakness around the towbar area that I decided it would have to go. Because I was well into DIY house renovation, I bought a two year old Transit panel van. First I set about installing windows; then we wanted bench type seats which would convert to a bed; then a sink and gas hob followed, and finally a raised roof. 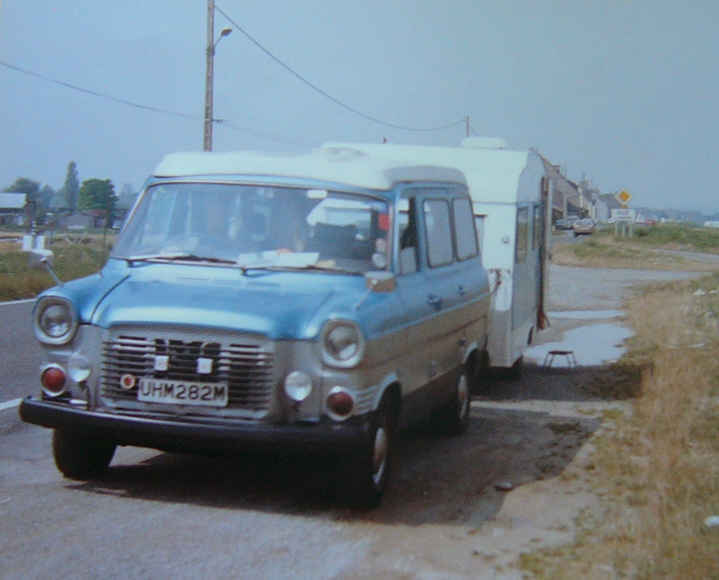 By this time we were a family of four and we used our ‘motor caravan’ for our first ever venture abroad – to Escalles – 8 miles down the coast from Calais. We used the Transit – mainly as a tug for the next six years, before changing to another Transit – this time with a diesel engine. And the process of conversion to motor caravan began all over again. 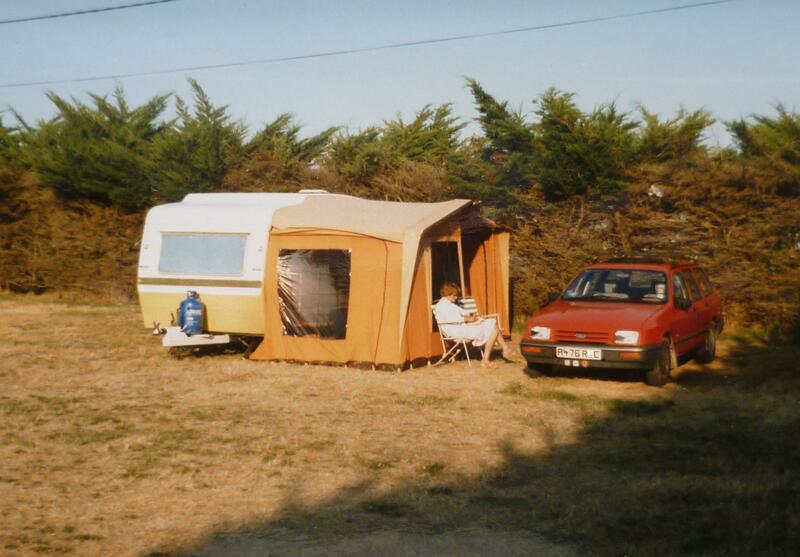 In 1979 we took our caravan to France for the first time towed by the Transit. We stayed at the camp site in the Bois de Boulogne in Paris for a few days before moving on to Brittany. After two weeks we returned to Calais and caught our Townsend Thoresen ferry back to Dover. By 1982 we were really taken with touring in France so we said good bye to the Transit and bought a new Ford Sierra Estate – with a 2.3 Peugeot diesel engine. For the next three years the four of us caravanned during every school holiday and for part of the summer holidays we took the ferry to France. By 1985 with my wife only doing part time work, when I was offered redundancy, I accepted but was immediately invited to return to work every Monday of each week. I quickly realised how restricting it was on our touring plans. At the end of the year I resigned. And we were free to go away as and when we felt like it. In part celebration, after 18 years we said good bye to our well-loved Sprite Musketeer and bought our first Avondale. During the next ten years, with the girls no longer reliant on us we began to plan longer tours abroad. Apart from the ferry, nothing was booked – we just went. Sometimes to Switzerland, sometimes to Italy, sometimes to Northern Spain. In 1991 it was time to consider another change of tow car. At the time, Citroen were winning the Caravan Club’s Tow Car of the Year with their diesel BX’s, so it was a new Citroen BXTZD Estate that I decided to have. And my love affair with Citroen diesels continues till this day. 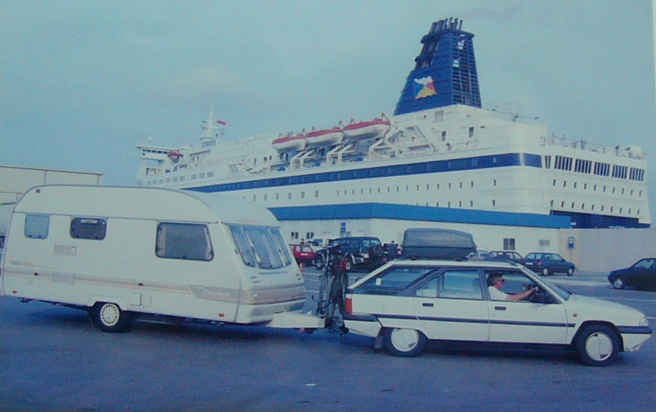 For sometime we had been looking at the idea of caravanning during the winter months in Spain, so for January of 1995 I booked P&O’s Pride of Bilbao and from that port, journeyed down to Malaga where we stayed at the site in Torremolinas. Showers and toilets were dreadful but it had electricity and water so we managed. The following year we did the Bilbao ferry again but this time drove to Camping Bon Sol at El Campello, near Alicante. We enjoyed it so much that we did the same site the following year. By 1998 I considered that P&O’s Bilbao fares had become too expensive – even for us as shareholders, so for that year I used the Dover/Calais crossing and drove through France, which I’ve done many times since. Sometimes with P&O, sometimes DFDS and sometimes on the tunnel. We tried most destinations ranging from Alicante round to Albufeira in Portugal. But our preference became the Costa del Sol. Our caravanning days were over. The caravan was sold; all the equipment was got rid of. There was nothing left. But as the months went by, I began to wonder if I’d made a mistake. After all, even when one has lost loved ones, life still needs to go on. 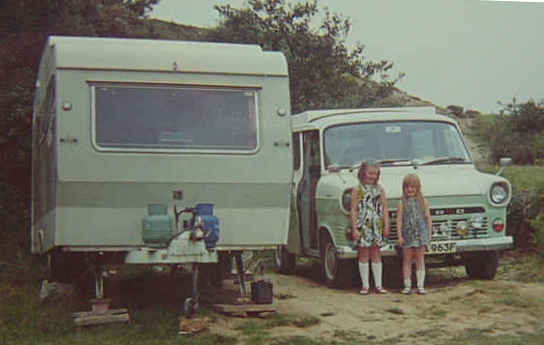 When my daughters mentioned that in August they were going to a rented cottage at Lyme Regis, I realised that if I had my van I could have joined them at the nearby Caravan Club site. I quickly looked around and on the CC’s website, I found my present Avondale. Now, at 89 years old, I still tow the van to Spain for four winter months and get away with the caravan during the summer in the UK as and when I feel like it. 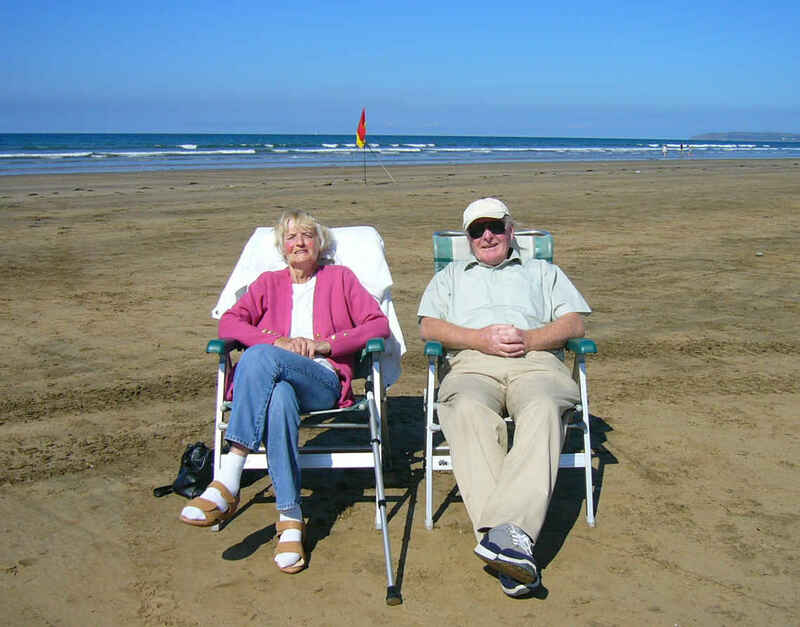 ******* (Footnote) ……..Although we never ventured abroad without full insurance cover, were it not for the fact that I was able to turn to the Caravan Club’s Red Pennant for help and advice in February of 2011, I would have been in serious financial difficulty. When a UK citizen dies in another country there are many formalities to be gone through. The death must be recorded at the local British Consulate and local death certificates and translations obtained. If the body of the deceased is to be taken out of the country, embalming must be arranged for and the necessary certification obtained. Finally transport and the customs declarations must be arranged. All this to be done when one is feeling bereft. Because of my Red Pennant policy, the Caravan Club’s agents in Spain arranged and paid for all of this; also for the chauffeuring of my vehicle back to the UK; my flight home; my phone bills and all our medical expenses. Westward Ho, Devon – August 2007. Well done that man. I lost my wife at 42 and it sure aint easy. But life has to go on. Thank you. As you say, life needs to go on. First of all, may I say that I am sorry for your loss. My parents had a Musketeer C, the same as yours, bought new in 1967. It came from Fleet Caravans, now long lost. They went to Lyon, France in 1970, with the Musketeer, and I went to Pierrepont, in Frensham. I learned to drive in France, and went around France and Italy in the Músketeer with my father’s (very early) Citroen CX. We subsequently moved to Frensham in 1991, and stayed there whilst our children were at school. I reignited my interest in Citroen cars- yes, I had 3 BX’s- and now tow behind a C6. My DS awaits a new engine, but I have the towbar to put the Carlight behind her! Greetings to another Citroen enthusiast. There aren’t many of us about. A pity about Citroen’s mistake in dropping the C6. Thank you John. I’m glad you’ve enjoyed the read. Sorry for your loss. Used to got to spain each winter in a motorhome. Traded it in for a caravan and wanted to continue my travels to spain, but at the age of 74 found the prospect daunting. Your blogs have given me renewed confidence to attempt it. Congratulations!!! Thank you Ian. I can’t think of a more pleasant way of getting through a winter than spending it here. I know how you feel when you say you find the prospect daunting. In the weeks prior to leaving, I’m always very apprehensive and wondering if I’m not taking on too much. But once I get set off and under way, all the apprehension vanishes. It’s tempting for me to say “Give it a try”, but only you know if it’s possible. Thank you – Your comment is appreciated. Very much enjoyed your site, many of your favorite sites and routes are ours too but you do seem to have seen much more of some places we just drive past thinking of Salamanca and Caceres in particular. 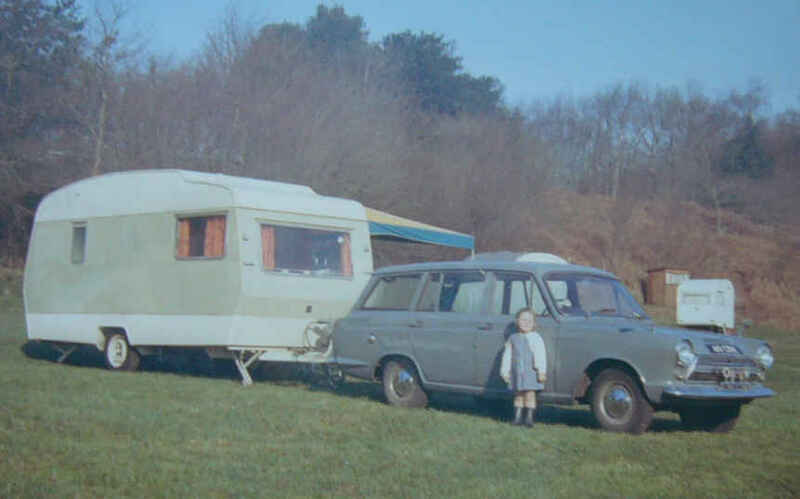 I lost my wife and caravanning partner at an early age and like you thought it was all over but I did find another lady eventually who was willing to give it a go. We have traveled extensively since retirement but now spend our 122 RP days split between Spring in Portugal and Autumn in Croatia. All the best and hope you can get a good few more trips in. Hello David & Marjorie. Thank you for your kind comments and appreciation. Yes – I am looking forward to my next trip which begins next Tuesday morning at Portsmouth and hopefully I will be adding some more blog pages. My best wishes to you both. Regards John. 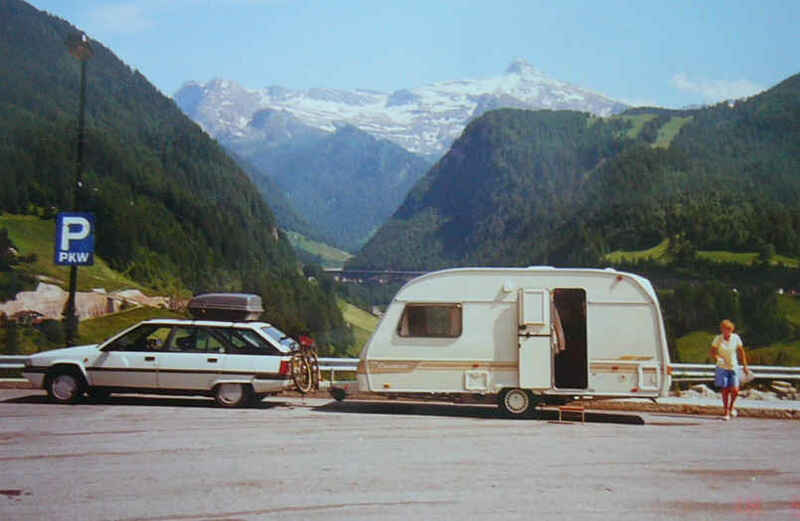 Just started heading off with the old caravan again after a 12 year gap, and came across this while researching ideas for Spain – what a truly inspirational blog. You have inspired us, and I’m sure many other people, to go for it and make the most of life. Hope the trip’s going well – looking forward to the next installment! Thank you and may I wish you all the best for your future touring. You truly are an inspiration! I am absolutely heartbroken to hear of your loss, but humbled by your courage to carry on. Looking at the comments, you have clearly given hope and had a positive impact on others who have tragically found themselves in a similar situation. I have very much enjoyed reading your blog and shall look forward to hearing more of your wonderful tales. Thank you for your kind comments. I’m just three days home from four months in Spain. Can’t wait to get the caravan hitched on again! How wonderful! We are thinking about Spain and Portugal for next winter. I shall have a good read of your blogs – then I might come picking your brains! Your welcome to contact me if you think I can help. I can certainly recommend spending the winters there. Thank you. I hope you manage to get to La Manga. You’re bound to enjoy. What an inspirational read. So sorry for your loss. Well done for finding a way through your loss and carrying on with your caravanning. My husband and I are hoping to retire in about 4 years time and you’ve certainly whetted my appetite for exploring Spain in the winter months. We currently have a motorhome, which is very useful for following our daughter to regattas (she’s a rower) but I think a caravan might give us more freedom (and comfort) when we reach retirement and have the luxury of being able to spend several months away. Thank you for your comment. I really do appreciate it. You have my best wishes for your future retirement and touring. Loved reading about your European adventures. We have spent the last three winters down the coast from el Pino at Almunecar, we occasionally play Petanque across the road from your site. We will look out for you this winter. Hello. Yes – It’s a popular venue. Many of the guys from El Pino play there. Very popular with the French contingent at the site. I’ve just found your blog today after you had commented on mine, thank you. I enjoyed reading about your adventures on your recent trip to Spain. We have tried the economy sailing before but usually end up with a rough crossing and I’m not keen on our precious campervan being on the open deck! Otherwise it is fine. Good to hear you found sunshine further south. I must say, what an inspiring blog of your life. It is something that can be admired! I read the whole blog and was truly saddend by your loss. I’m glad you found the love for caravanning once again where you can reminis and share the memories. I have just gotten our family into this and hope to do the same as what you once did with your experiences. Many thanks for sharing! Thank you Shane. Your comment is appreciated. I wish you all the best in your future caravanning.